The brave Students who District Deeds reported had been denied adult support in their 45 minute meeting on Tuesday (5/30/17) with Marten, also strenuously objected to her attempts to manipulate them with her disingenuous claims of “I feel your pain” and other SDUSD propaganda lies. In the following video of the SDUSD Board Meeting you will notice that Marten begins her announcement of the INTERIM Lincoln Principal with a sly. self-satisfied smile shifting uneasily in her seat and then the bottom drops out of her manipulation as members of the Lincoln High School Community call her out for her lies. 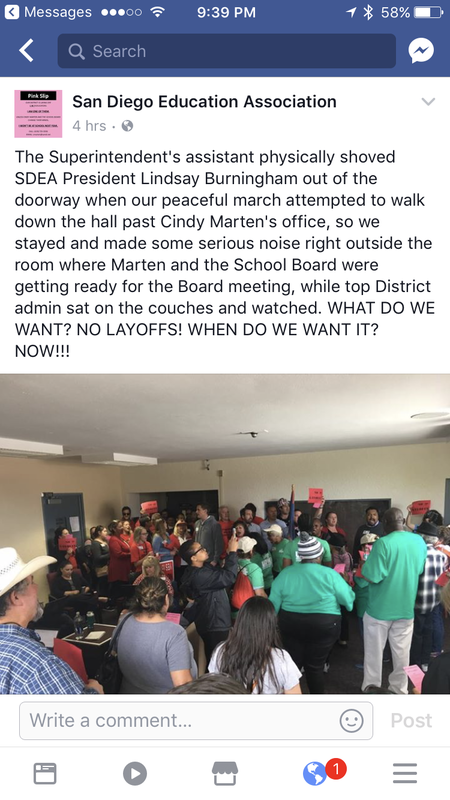 Board President Richard Barrera hurriedly called a “5 minute recess” and then had the District Office Technicians edit out the protest and the actual 2 HOUR delay. When he resumes there is NO MENTION of the 2 hour delay that the public had to stand outside in the cold air waiting for the meeting to re-start. Before Marten, Barrera and the rest were able to scurry away, Lincoln High Students were able to call Marten out for the lies she told the students that morning. Local TV Station 51 KUSI provided some additional footage of the protest. WOW…the Marten administration toxic work environment must be unbearable for Central Office employees having to deal with her incompetence every day!!! We have reports from the Lincoln community that the Supt. Marten propaganda machine has misrepresented the Lincoln High School situation to numerous local media outlets to attempt to sway public opinion. District Deeds will continue to be report the REAL story at Lincoln High School and throughout the SDUSD in upcoming posts…Stay Tuned!!! The Lincoln High students showe real bravery im standing up for their rights and the rights of their fellow students! I hope the media fully investigates this matter and does not report misleading stories. It’s awful how the ditrict is wasting our tax payer dollars in hiring two administrators to “help” a very experienced, trusted and capable administrator, Mr. Soto. Based on the level of deceit demonstrated by this school board and superintendent, this “help” will be no more than a way for the district to find any fault with his leadership. We need to hold the district accountable!